He was born January 17, 1934 in Pecan Gap, Texas, the son of Ernest Petway Green and Sally Elitha Saxon Green. Milton retired from the U.S. Army as a Master Sergeant. He was a veteran of both the Korean and Viet Nam wars. After retirement from the Army, he made his home in Enloe and took on the slower pace of life that it had to offer. 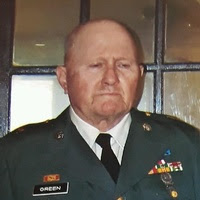 Master Sergeant Green enjoyed spending his retirement years by helping his neighbors and the surrounding community by repairing air conditioners and refrigerators at a bargain price. He was a member of the Calvary Baptist Church in Cooper. He is survived by his wife, Laurritta Ann and four daughters; Rita Kellum of Arlington,Texas, Laura Schmitt of Minneapolis, Minnesota, Angela Heath of Enloe,Texas, and Bobbie McCloud of Poway, California. Survivors also include his seven grandchildren: Savanna and Tara Heath of Enloe, Jacalynn Kellum of Arlington, and Corey, Courtney, Christina, and Christopher McCloud of Poway, California; and one sister, Dorothy Faye Womack. Milton was preceded in death by his parents, three sisters: Elvi Golforth, Ophie Mullens, and Louise Allen, and two brothers: George Green and James (Doon) Green. Services will be held at the Calvary Baptist Church in Cooper on Thursday, November 15, 2018, at 2:00 p.m. with Brother Chip Pinkerton officiating. Visitation will be one hour prior to the service at 1:00 p.m.
Interment will occur with full military honors at the DFW National Cemetery in Dallas at 9:30 a.m. on Friday, November 16, 2018. Arrangements are under the direction of the Jones-Walker Funeral Home and Cremation Service in Commerce.